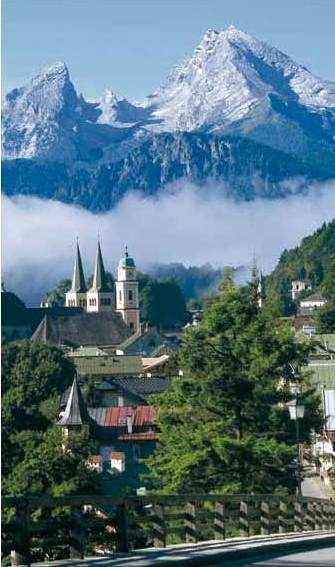 Each day holidaymakers experience Berchtesgaden's very special flair at the foot of the Watzmann and feel truly royal. It is this very special mix of culture and nature which attracts people from all over the world to Berchtsgaden in the centre of an area with a unique healthy climate. No matter if you are participating in a meeting at the Kongresshaus, are strolling through the area via the historic market past magnificent bourgeois houses, visiting amiable shops and beautiful cafés: you can combine everything with the enjoyment of art and culture, sport, spa & fitness and leisure activities. ...wellbeing can proceed with the Obersalzberg railway to a height of 1,000 metres and from there begin hikes, enjoy the view or play golf. A visit to the Watzmann Therme is always inviting. Besides this there are numerous sporting opportunities available for every season. The Berchtesgaden area offers the most beautiful of nature's performers, both up hill and down dale. Botanical beauties are on offer first and foremost at the Berchtesgaden National Park – a picture book protected area. The pearl of the Berchtesgaden National Park is the Königssee. Its name is known throughout the world and it stands for emerald-green water in the middle of a unique landscape. Glide across the lake in a silent electric boat, listen to the impressive Königssee echo. On the St. Bartholomä is the hunting lodge of the Bavarian kings (today the historic tavern of St. Bartholomä) and the St. Bartholomä church which dates back to the year 1134.